Once you have visited Spaceline Dental Studio, as far as your dental problems are concerned you can relax andbe rest assured that you are in safe hands. They have a dedicated and thorough professional team as well asapproach. They may call you for an extra sitting but never compromise on quality work.I would like to thank Dr. Arpit and staff for their great patient care and dedication to their clients.I will surely recommend Spaceline Dental Studio to my family and friends. I was also very impressed with your ultra modern surgically clean Surgery with all the very latest equipments.Please convey my thank you to all your assistants who were also very competent and able. Once again Thank You very much. High tech equipment makes the experience for a new and nervous patient extremely comfortable and stress free. Not to mention the ease at which both of them carry out all the procedures. All I can really say to Dr. Arpit and Dr. Ruchi is thank you for changing my perception about dental treatment forever. And for all those like me who are pertrified of dentists, trust me it’s worth the trip to Spaceline Dental. I am 76. Since the last two years most of my teeth started decaying. I did not bother to go to my dentist. (This is a human tendency). Ultimately, I had to go to Dr Arpit and his wife, Dr Ruchi Doshi. Both of them are young,energetic and talented Orthodontists, running Spaceline Dental Studio in Ghatkopar. To my surprise, this coupie, assisted by their team of other dentists removed the complete decayed portion,without any pain. It is a great relief for me. Everything was done just in three sittings. I wish them all the success. Space line studio team is really very friendly to every patient! it is my first and best treatment is provided here . I am very happy by my docs : Dr. Arpit doshi and Dr. Ruchi doshi. 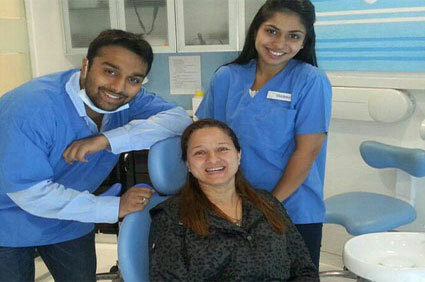 They are best dental specialists and also very talented in their field … thank you for good advice for my dental care..